One night after her show-stealing performance of “It Ain’t Me, Babe” at Sunday’s Billboard Music Awards in Las Vegas, Kesha once again paid tribute to Bob Dylan. This time, however, she was joined by more than two dozen Dylan acolytes paying tribute to Robert Zimmerman at the first night of Dylan Fest, a two-night charity concert celebrating Dylan’s 75th birthday (the second night takes place on his actual birth date, May 24) at Nashville’s Ryman Auditorium. Kesha let the music do the talking as she pointedly performed Dylan’s gospel-tinged standard of freedom and redemption, “I Shall Be Released.” Dressed in what looked to be a powder blue sparkly Manuel suit and barefoot, Kesha started the song slowly, standing still by the microphone, before building to a swaying, dramatic conclusion, as she held the last “shall” in the final line and looked upward. 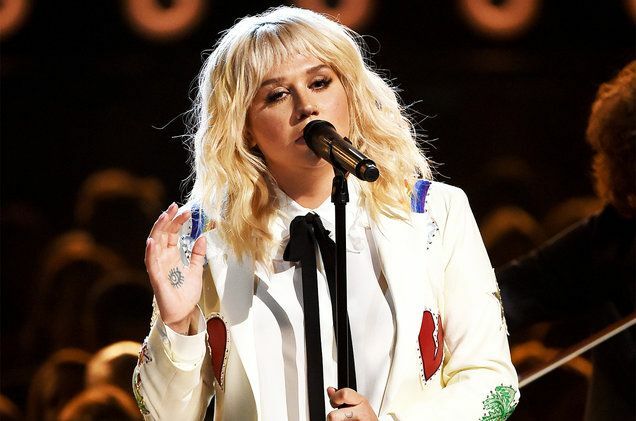 She didn’t mention Dr. Luke as she continues to fight to be released from her contract with the producer’s Kemosabe label following her allegations that he sexually and verbally assaulted her, but her song choice spoke volumes. Moon Taxi, “All Along The Watchtower”: The Nashville-based rock band and festival favorite received the evening’s longest standing ovation for its staggeringly powerful version of the ‘60s rock classic. Vocalist Trevor Terndrup and the band started the song with an almost jazzy feel before exploding in to an extended full-throttled rocker, complete with Spencer Thomson’s searing guitar solo that would have made Jimi Hendrix proud. Ruby Amanfu, “Not Dark Yet”: Frequent Jack White collaborator Amanfu covered the melancholy track, originally from Dylan’s Grammy-winning album of the year, 1997’s Time Out of Mind, on her 2015 album Standing Still, but she took the song to a new height with her soulful, quietly powerful reading that wrenched all the resigned sadness of the song without ever tipping over into the maudlin.